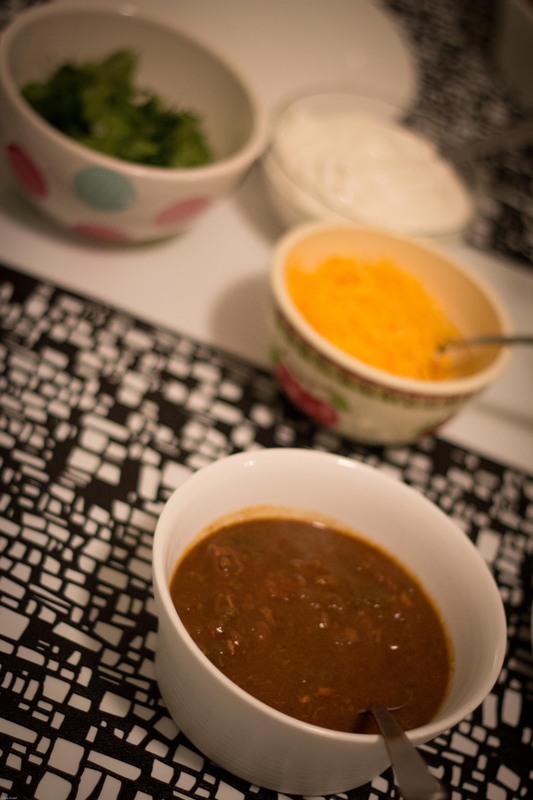 I decided to cook Texas style chili last night for a dinner party with my best buddies. It’s pretty labor intensive but luckily the recipe calls for one Shiner Bock beer, which leaves you with 11 left to drink. HEY-O. Originally an Emeril recipe with our changes below. One of my lovely dinner gusts, Dana Juhasz Ardell took this pic! First brown the meat in the oil until no longer pink. Put heat to medium-high and add onions, garlic, jalepeno peppers, pablano peppers, and chili powder, stir it up and cook until onions start to wilt. Just a note about the pablano peppers – they are super hard to skin, so I roast them on the open flame on my stove, put them in a plastic bag and tie it up so the steam helps the skin come off. Then add the cumin, oregano, salt, pepper and tomatoes, cook for 1 minute. Then add the beer and tequila, deglazing the pan while stirring. 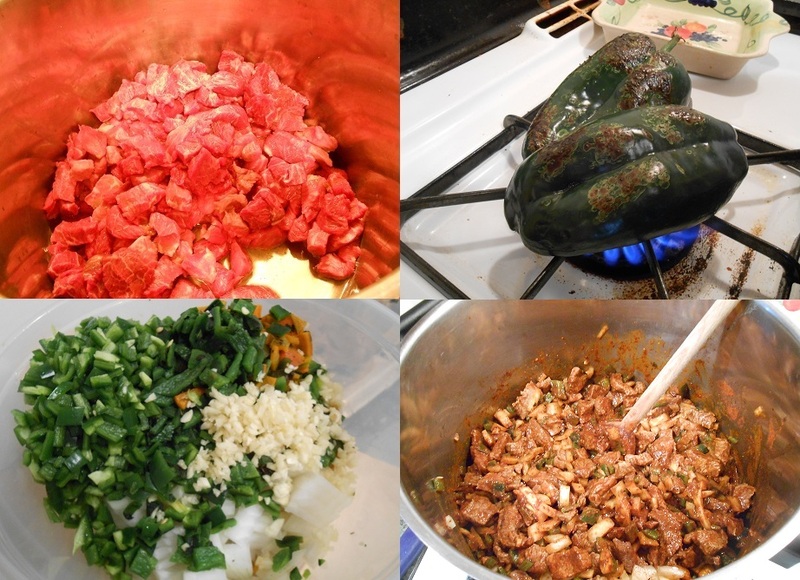 Then add the chiles in adobo sauce and the 4 cups of stock – stir well and bring to a boil, then turn down to simmer, partially covered and stirring occasionally for 2-3 hours (really the longer the better). Then add the masa harina 1 tsp at a time until to desired thickness. Top with sour cream, cheese, and cilantro if you’d like! 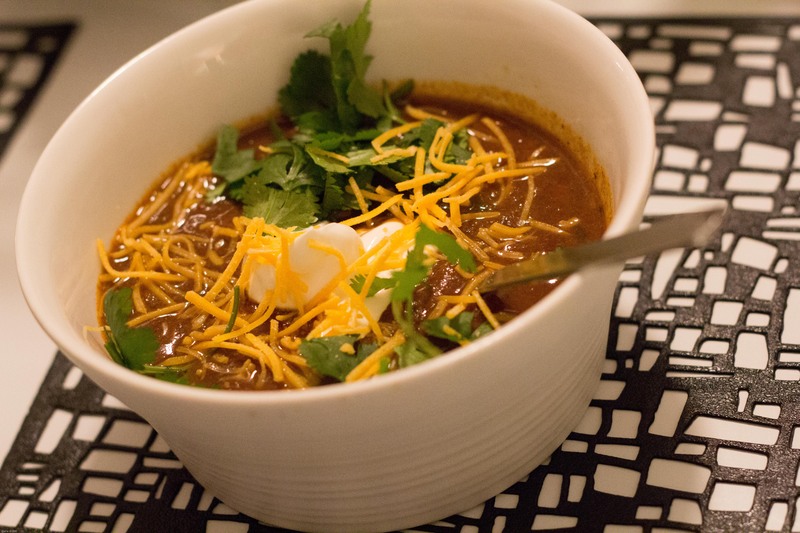 For the dinner party of 6 I doubled this recipe and was plenty with a couple bowls left over. Winning. Another cool shot from Dana the awesome-est.